Founded in 1935 as Reliant Engineering Comany of Tamworth Ltd, by T.L. Williams and E.S. Thompson, Reliant had a fascinating history that spanned 66 years before they built their last vehicle in February 2001. Whilst they are often associated with three wheeled cars, most notably the Reliant Robin, they also built economy four wheelers and a range of highly succesful sports cars. In addition to numerous other projects, they also created a car industry for both Turkey and Israel by designing their first vehicles for manufacture in those companies. A brief history of the company is available here whilst histories for each model is provided below. 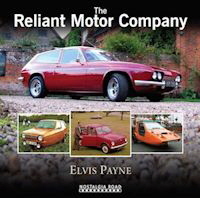 The complete history of the Reliant Motor Company with details of each vehicle that was manufactured is listed in the new book, “The Reliant Motor Company” by Elvis Payne. Click here for miore details.